The oldest reference to the Colours carried by the Regiment, in 1680, shows them to have consisted of the white cross of St Andrew on a blue ground; in the centre, the Thistle and Crown in gold surrounded by the circle of St Andrew and the motto “Nemo me impune lacessit” in gold. There were several minor variations between the Lieutenant-Colonels’, Majors’ and Captains’ Colours. In 1707 the union of England and Scotland brought about many changes, and the Colours of the Regiment lost their pre-eminently Scottish design. 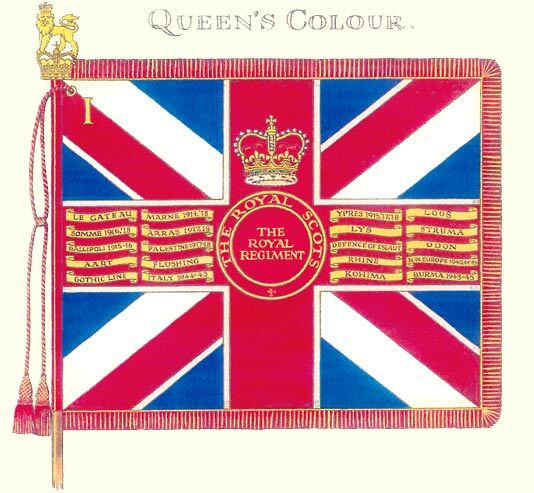 In 1743 the 1st and 2nd Colours (now known as Queen’s and Regimental Colours) were instituted, and from then on various changes were from time to time introduced. The Regimental Colour (of Royal Blue) was embroided with “The Royal Cypher within the collar of the Order of the Thistle with the Badge appendant: in each of the four corners the Thistle within the circle and motto of the order, ensigned with the Crown. The Sphinx, superscribed Egypt”. The full list of Battle Honours is given below. Those printed in CAPITAL type were borne on the Colours. Over the last two hundred years Battle Honours have been awarded to cavalry and infantry regiments of the British Army in recognition of particular service, either in a campaign or at an individual battle. Although the individual Honour may be won by a particular battalion, or battalions, the award is to the Regiment as a whole. Very few Battle Honours were awarded to British Regiments before 1800. The first actual award to the Regiment, although subsequently most certainly not the oldest Battle Honour, was the granting, in 1801, of the distinction of bearing on the Colours the Sphinx and the word ‘Egypt’ to mark the 2nd Battalion’s role in the campaign there against Napoleon. The first traditional Battle Honours to be awarded to the Regiment, and carried on the Colours, were Peninsula, Niagara and Waterloo – all awarded in 1815. The Regiment was subsequently awarded a total of 29 pre-World War 1 Honours, from Tangier 1680 to South Africa 1899-1902, and these were carried on The Regimental Colour along with the post World War 2 campaign award of Gulf 1991. The sheer scale and complexity of the battles of World War 1 presented new problems over the award of Battle Honours. Battles lasted for weeks or months rather than the day or two of earlier actions. The area covered and number of troops involved, particularly on the Western Front, eclipsed anything previously seen and, with both the scale and widespread geographical areas of Regimental involvement, the number of Battle Honours that could fairly be claimed was obviously going to be far too many to be accommodated on the Regimental Colour on which, as explained above, all pre-1914 Honours were carried. 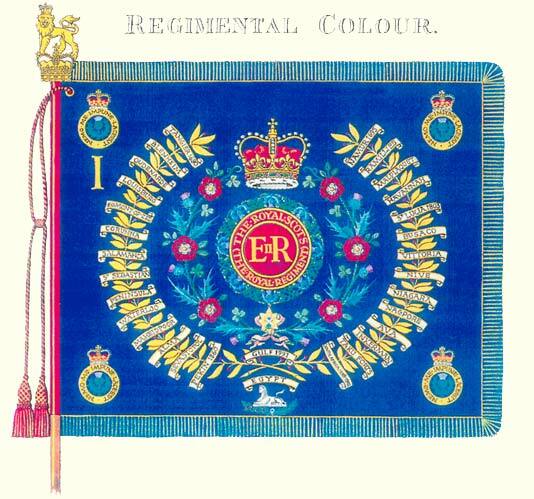 The decision was made that a Regiment would be awarded all Battle Honours that the Honours and Distinctions Committee of The War Office considered that they were entitled to, and the Regiment could choose up to 10 to be carried on the (then) King’s Colour. The 79 are condensed down to 71 when repeats of major Honours won over a number of years, such as Ypres or The Somme, are counted singly. The Regiment was awarded 79 Battle Honours out of a total of 168 that were designated and, from those, the Regimental Committee recommended the ten shown in CAPITAL type below to be carried on The King’s Colour. A similar procedure was adopted after World War 2 – except that a total of 618 were designated of which the Regiment was awarded 39 with, again, 10 selected to be carried on the, by then, Queen’s Colour. TANGIER 1680, NAMUR 1695, BLENHEIM, RAMILLIES, OUDENARDE, MALPLAQUET, LOUISBURG, HAVANNAH, EGMONT-OP-ZEE, EGYPT, ST LUCIA 1803, CORUNNA, BUSACO, SALAMANCA, VITTORIA, ST SEBASTIAN, NIVE, PENINSULA, NIAGARA, WATERLOO, NAGPORE, MAHEIDPOOR, AVA, ALMA, INKERMAN, SEVASTOPOL, TAKU FORTS, PEKIN 1860, SOUTH AFRICA 1899-1902. Mons, LE CATEAU, Retreat from Mons, MARNE 1914, 18, Aisne 1914, La Bassee 1914, Neuve Chapelle, YPRES 1915, 17, 18, Gravenstafel, St Julien, Frezenburg, Bellewaarde, Aubers, Festubert 1915, LOOS, SOMME 1916, 18, Albert 1916, 18, Bazentin, Pozieres, Flers-Courcelette, Le Transloy, Ancre Heights, Ancre 1916, 18, ARRAS 1917, 18, Scarpe 1917, 18, Arleux, Pilckem, Langemarek 1917, Menin Road, Polygon Wood, Poelcappelle, Passchendaele, Cambrai 1917, St Quentin, Rosieres, LYS, Estaires, Messines 1918, Hazebrouck, Bailleul, Kemmel, Bethune, Soissonais-Ourcq, Tardenois, Amiens, Bapaume 1918, Drocourt-Queant, Hindenburg Line, Canal du Nord, St Quentin Canal, Beaurevoir, Courtrai, Selle, Sombre, France and Flanders 1914-18, STRUMA, Macedonia 1915-18, Helles, Landing at Helles, Krithia, Suvla, Scimitar Hill, GALLIPOLI 1915-16, Romani, Egypt 1915- 16, Gaza. El Mughar, Nebi Samwil, Jaffa. PALESTINE 1917-I8, Archangel 1918-19. Dyle, DEFENCE OF ESCAUT, St Omer-La-Bassee, ODON, Cheux, Defence of Rauray, Caen, Esquay, Mont Pincon, AART, Nederrijn, Best, Scheldt, FLUSHING, Meijel, Venlo Pocket, Roer, Rhineland, Reichswald, Cleve, Goch, RHINE, Uelzen, Bremen, Artlenberg, NORTH- WEST EUROPE 1940, 44-45, GOTHIC LINE, Marradi, Monte Gamberaldi, ITALY 1944-45, South East Asia 1941, Donbaik, KOHIMA, Relief of Kohima, Aradura, Shwebo, Mandalay, BURMA 1943-45. Wadi El Batin. GULF 1991.